Another game. This one was even, with me taking white. 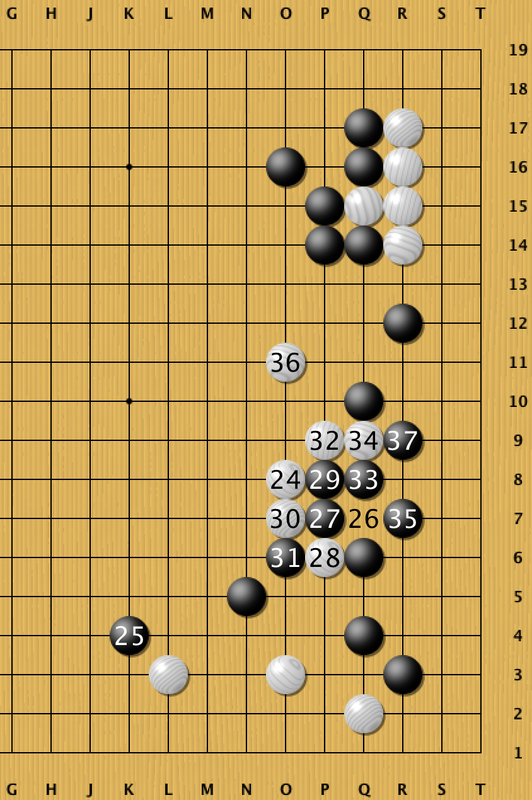 The opening was sensible enough, with my opponent taking sanrensei. Then it goes a little of script, with 11 at N5. I suppose the good news is that this will be a perfect chance for me to practise dealing with moyos. 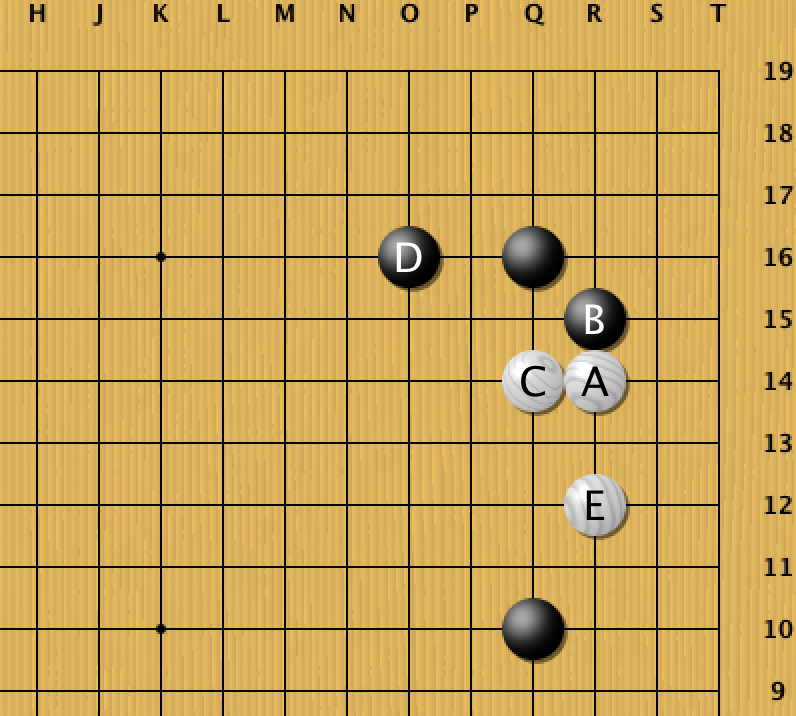 I start be approaching black’s other corner and am a little surprised by 13 at R12, and the following sequence. 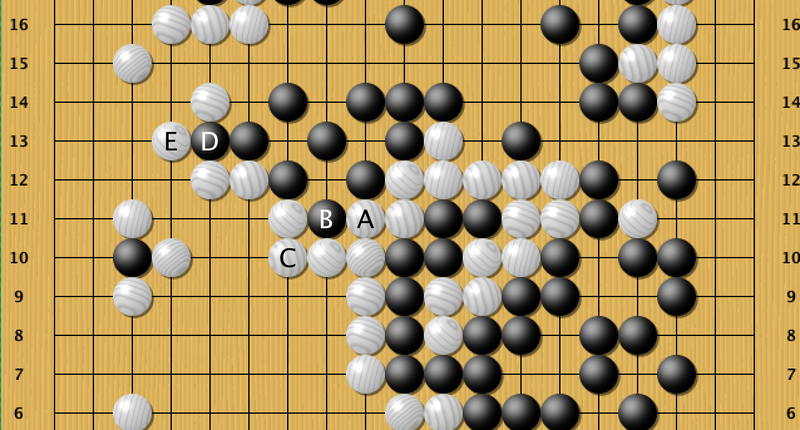 Black is building a wall facing the wrong direction. 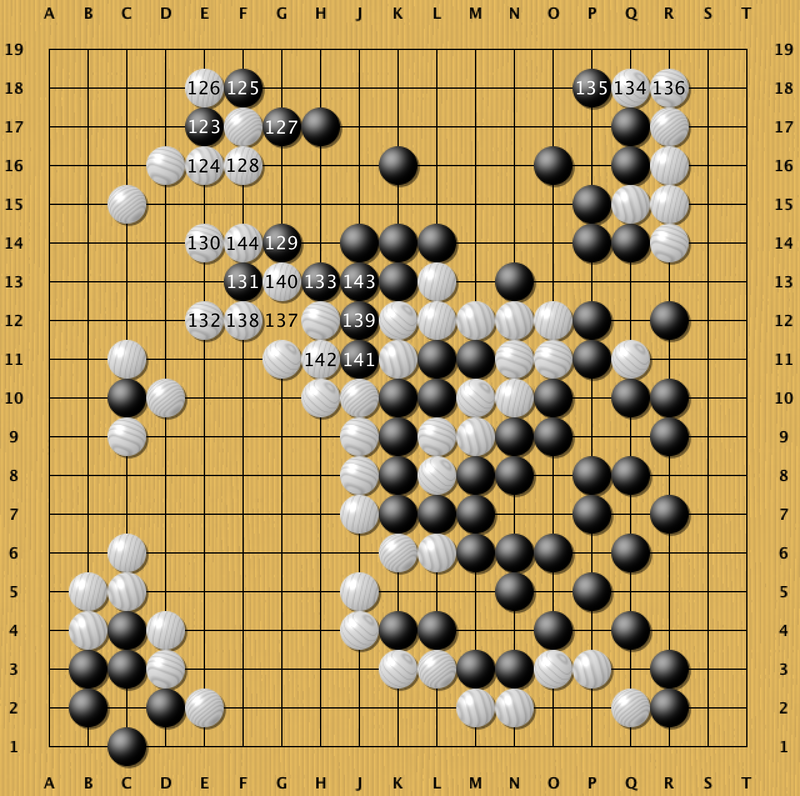 What black should of played? I guess this means I’m ahead? I wonder if I can make the most of my early lead. I decide to stay calm and collected, and opt to simply enclose one of my corners with 22. Black responds very passively, giving me sente. 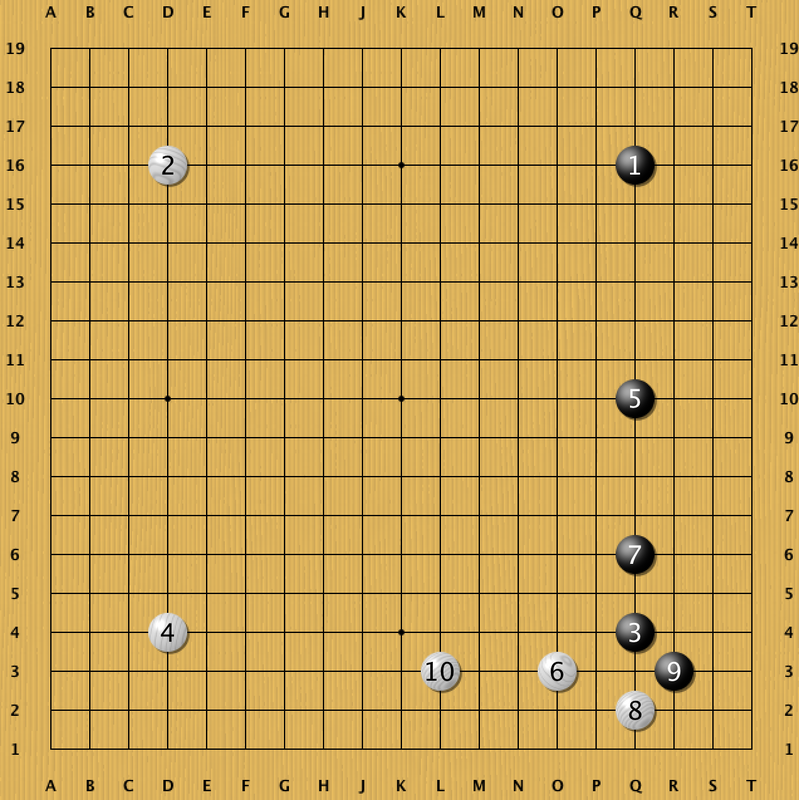 Time to work out how to deal with black’s influence. I probably should have found time to play this. 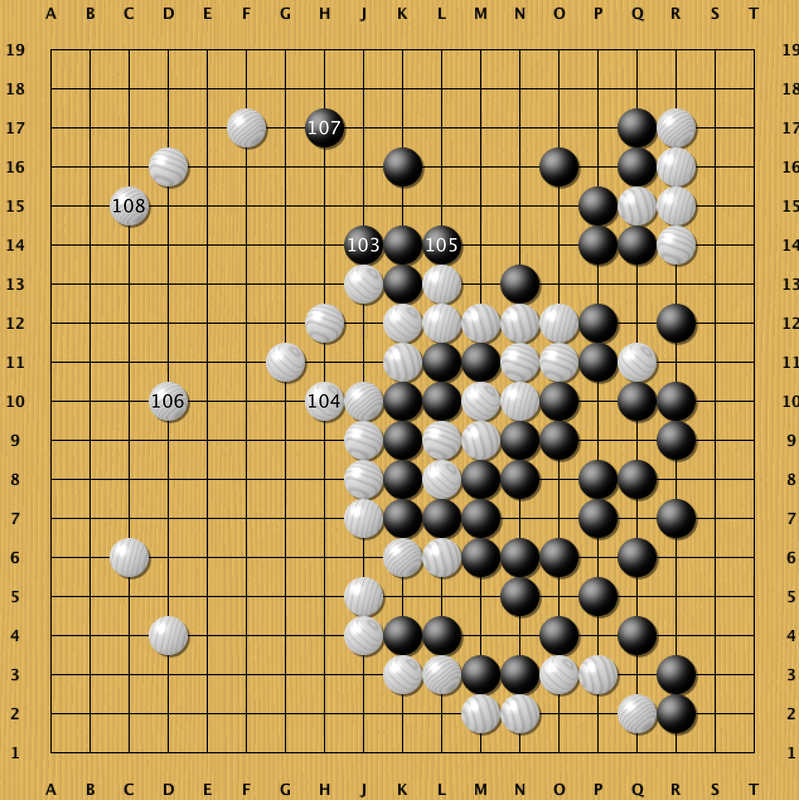 But instead I miss my opportunity and take an enclosure instead, after which, black starts his attack. 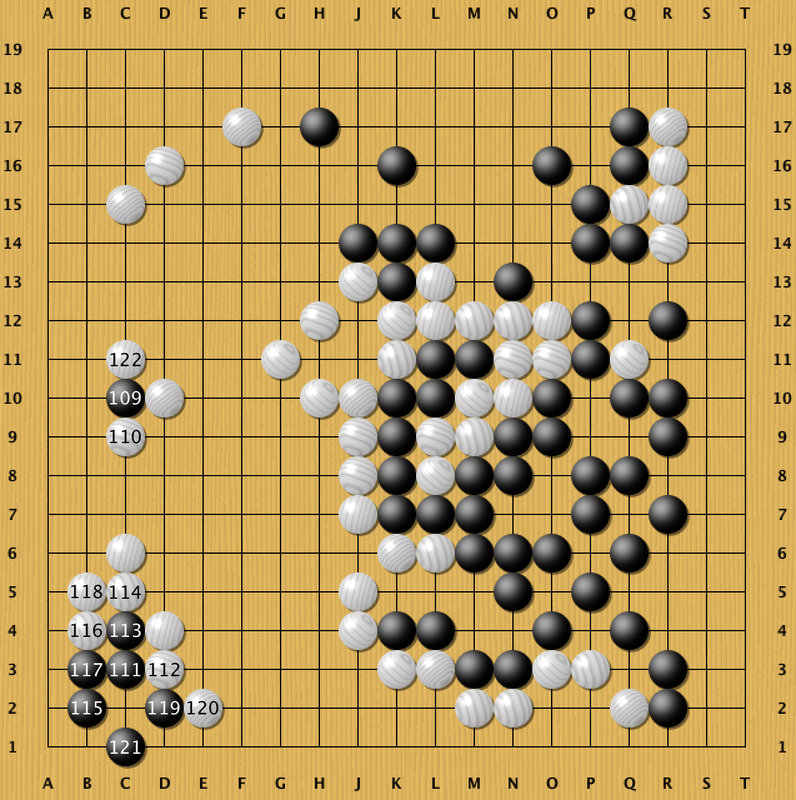 I decide to calming let black take my stones if he really wants to, and instead focus on gaining some central influence which I can use the huge amount of potential I’m slowly building up on the left hand side of the board. 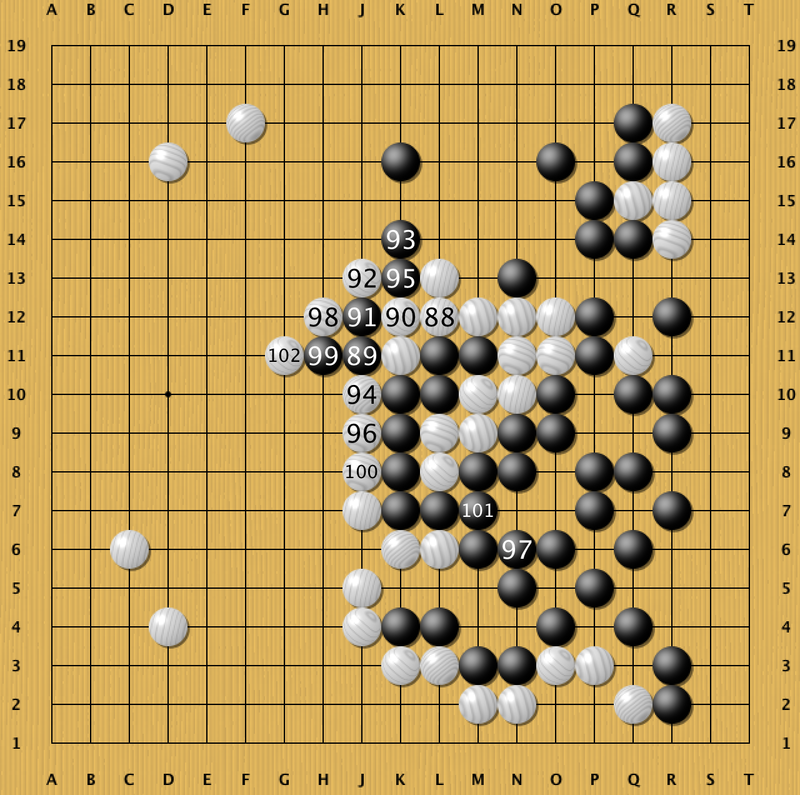 With 93 he makes a mistake, and I capture some stones, which takes the pressure off my group, and come out of the fight with a huge amount of influence. I think if 93 had simply protected the cut, I would have a hard time winning the game. 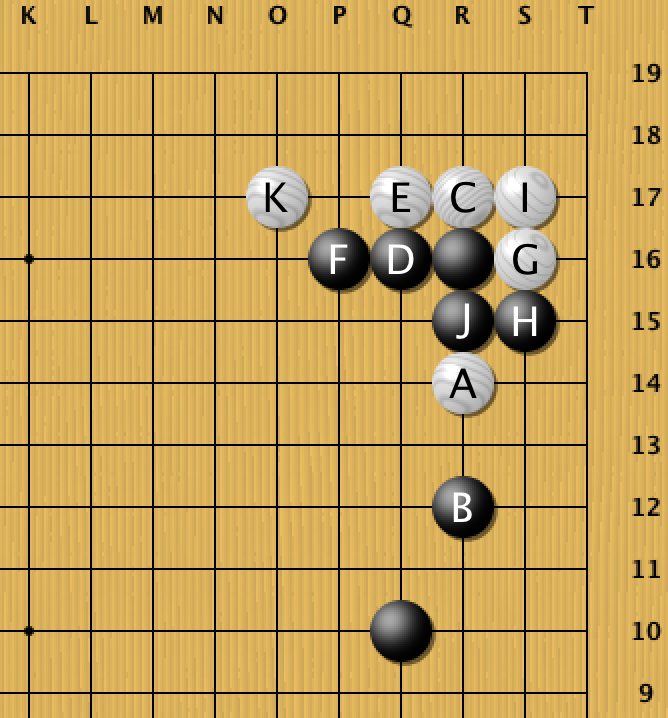 This sequence of moves feels really slow for black, I don’t think I should be allowed to take the star point at D10 so easily. Now, all i have to do to win is to hold on to most of the points! I’m pretty sure 122 is a mistake. 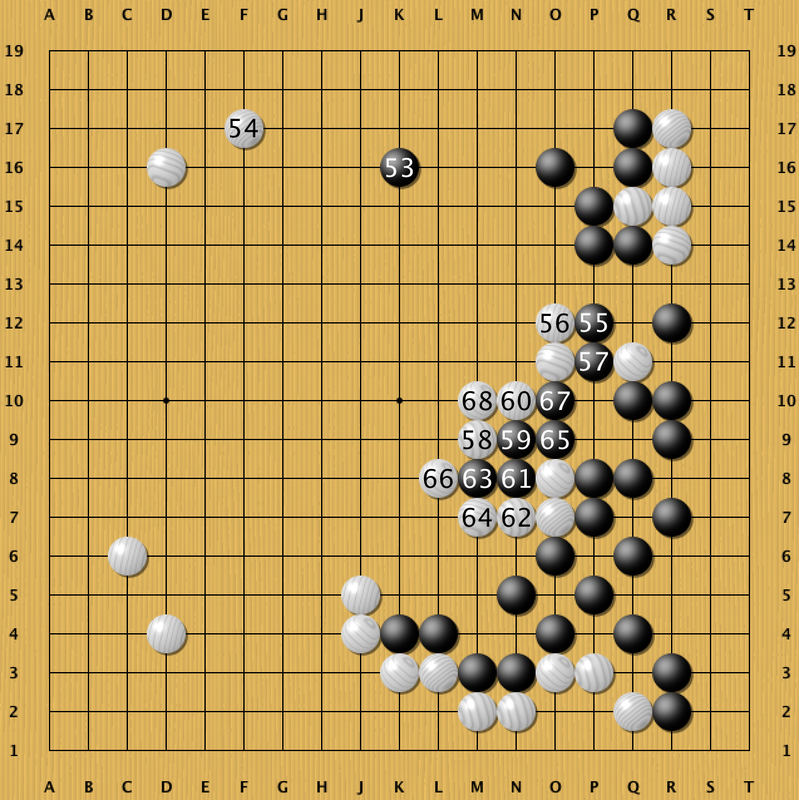 The aim was to kill off as much aji as possible, but leaving all those cut points/potential forcing moves? Probably not a good idea. A better way to play? 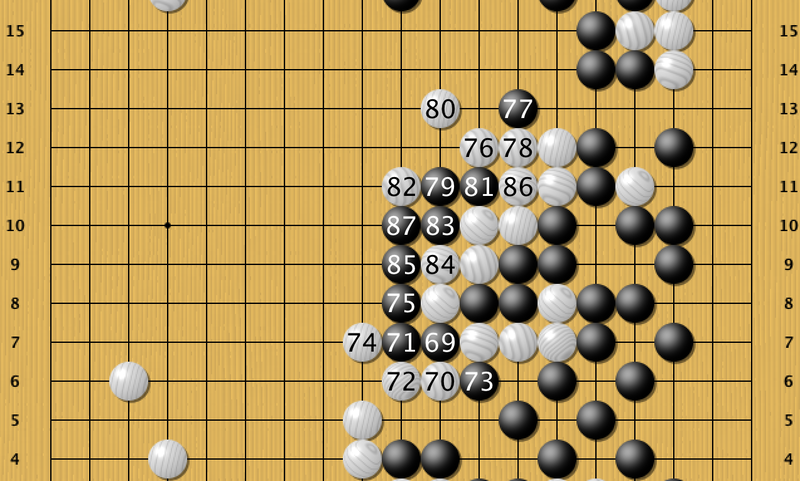 White 166 was maybe a mistake? 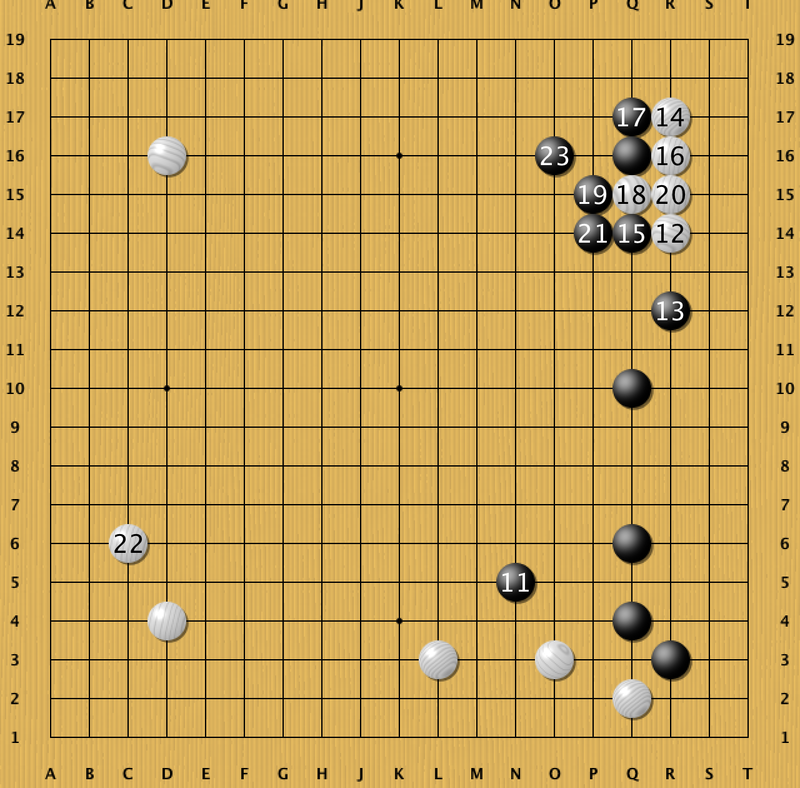 Seems quite a small move and gave black a chance to attack my corner? It appears to be too little too late. 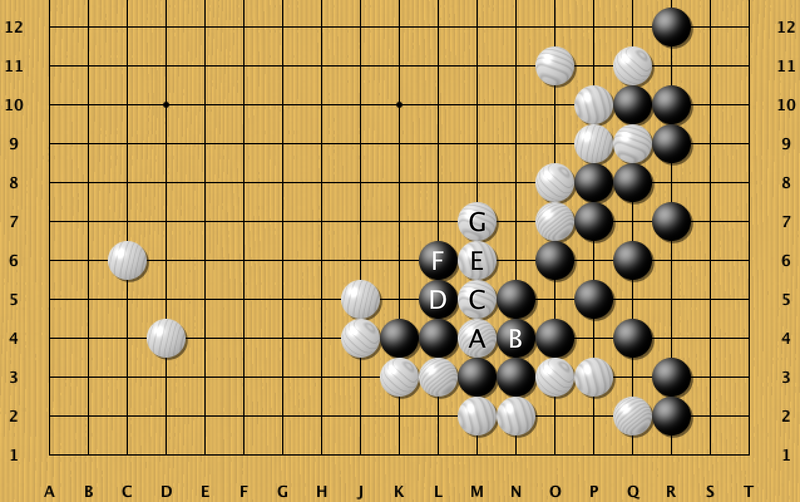 All that’s left is some more endgame, and I win by 15.5points. 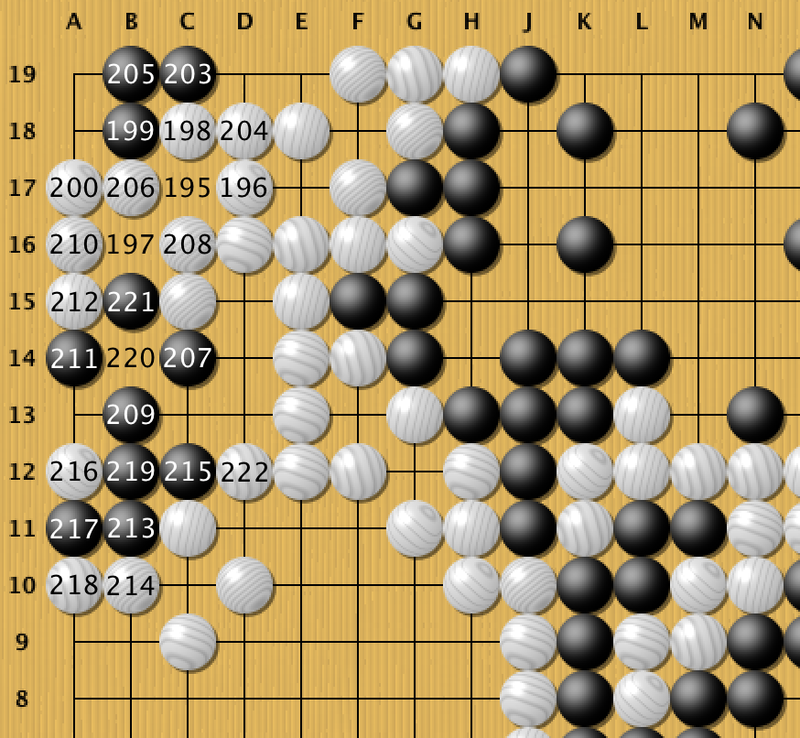 While I think I gave my stones on the right up too easily, I think this game is a nice demonstrating of not having to save everything and the dangers of focusing your attack on one group and forgetting about the whole board. 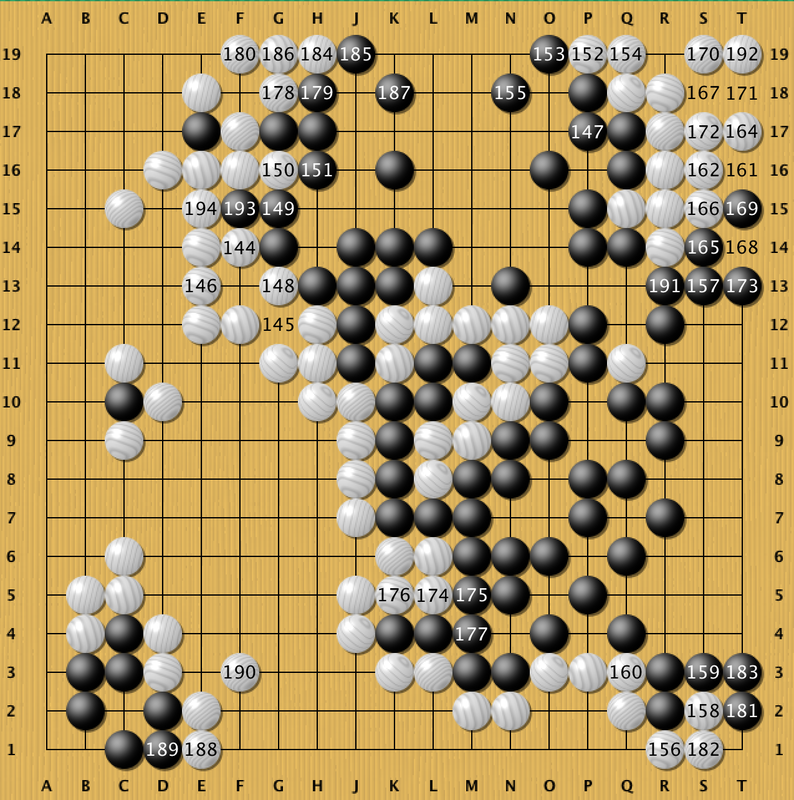 This entry was posted on Saturday, September 5th, 2015 at 9:20 am and is filed under Go. You can follow any responses to this entry through the RSS 2.0 feed. You can leave a response, or trackback from your own site.